Let the fun begin and the night be wild and crazy when you get all your BFFs together for your 21st Birthday. Accessorize all your girls with their very own Personalized Birthday Party Can Wraps celebrating your special night. Have lots of fun while keeping your favorite beverage cool and refreshing. I am very pleased with this purchase from the website to price to delivery time. I like the wording and colors. Wish there was a bottom to keep can colder. Is a little thin but it was bought more for fun and memories. 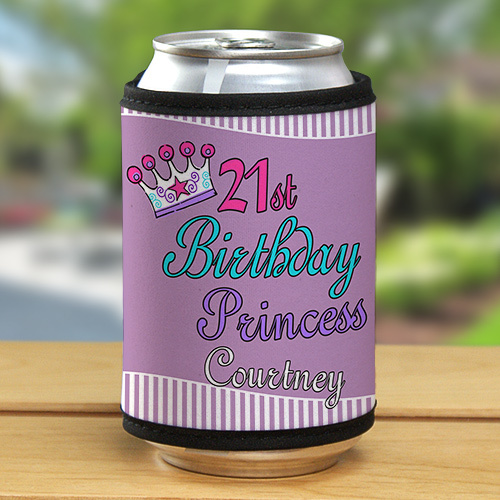 This Personalized Can Cooler is a great gift idea for any birthday girl turning that special age of 21. GiftsForYouNow.com has a wonderful collection of Personalized 21st Birthday Gifts for all your needs. Whether you are looking for 21st Birthday Keepsakes or 21st Birthday Apparel, shop GiftsForYouNow.com for all your Personalized Birthday Gift ideas.